ArtsECO stands for Arts Education/Community Ecosystem. Centered out of UWM’s Peck School of the Arts Department of Art & Design, it develops teachers as change-makers. ArtsECO is backed by a strong and sustainable community of arts organizations, non-profits and K-16 school partnerships. The program recruits and develops thoughtfully engaged, social justice-oriented pre-service teachers and supports them as they grow into inspired mentors who integrate the arts into the classroom. 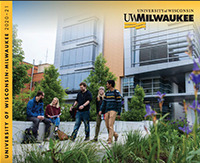 The program develops teachers’ abilities to leverage and share the rich assets of Milwaukee and Southeastern Wisconsin. Visit the ArtsECO page for more information.